Participation in this ceremony is via an online video-conference call. Cedar and Sweetgrass, Sandalwood and Copal, Bear Root, Sage and Tobacco. These are the Seven Sacred Sisters who offer themselves for our Cleansing and Blessing! When the Soul is dissonant, our life experience is dissonant as well. We experience this as hardships and difficulties, misfortune and illness. A Shamanic Soul Cleansing is, in essence, a cleansing of the contamination residue that is left in the field of soul force – that is, in the Soul – following conflict and discord, heartache and grief, or trauma and travail in a person’s life. 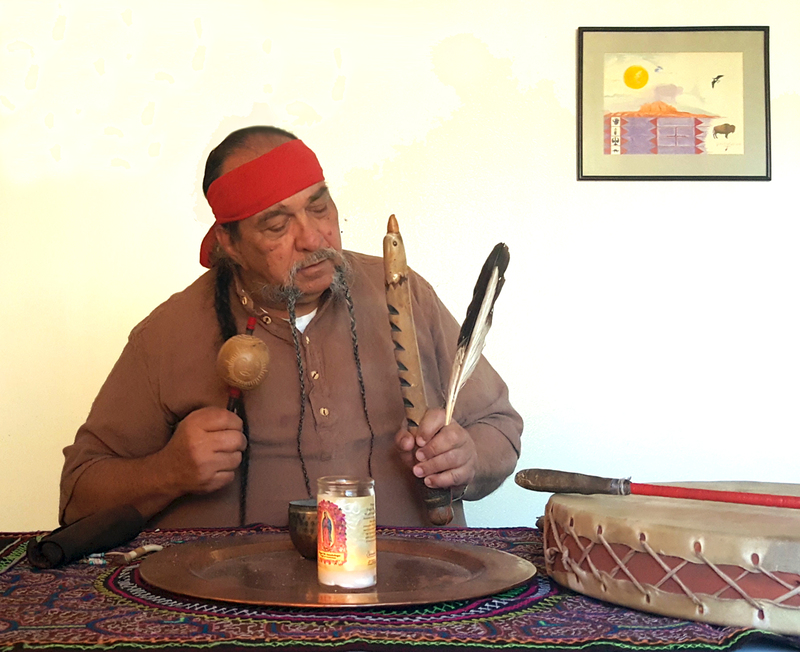 Shamanic methods and techniques are designed to address just such situations, allowing for the removal of disrupted life-force – separating it from the healthy life-force – purifying it and then returning it back into the Soul. Once the life-force has been cleansed and re-infused into the Soul it is able to be drawn upon for the regeneration of our health and well-being. Shamanic Blessings initiate a frequency structure into the field of soul-force that, when activated, expresses manifestly in accord with the nature of the blessings invoked. In order for a Blessing to authentically occur, the prerequisite is to first have the disruptive soul-force cleansed, neutralized. Then this field of life-force, no longer in a negative state, can be set to resonating in accord with one’s Spirit’s intention and desire. Cedar, for deep cleansing and the dispelling of negativity. Sweet Grass, to make pleasant a residing place for your Spirit and the Spirits of your alliance. Sandalwood, to call upon the Ancestral Spirits for their oversight, insight and protection. Copal ‘makes life beautiful’ and brings about an empowerment. Bear Root. This root cures what ails us and reconnects us to the Womb of the Earth Mother. Grandmother Sage/Spirit Caller (sagebrush, not California sage) to call in the specific attunement that we require to aid us in creating the harmonic resonance in our Soul that will enable the manifest expression of our heart’s desire. Tobacco. Grandfather Tobacco carries our prayers to the Loom of Creation, causing the Tapestry of Creation to reweave itself in accordance with those prayers. Through the knowledgeable utilization of the assistance of the Spirits of these Seven Sacred Sisters, we, in our Shamanic Ways, are able to set into motion the song of our Spirit’s intent, i.e. : a Blessing! Contact Me, including your requests of intention (up to three). These might be requests for your health, family, business, safety, protection, happiness, etc. Or they may be for the things you choose to bring into your life, ie, a relationship, abundance, a greater compassion, forgiveness. It is really up to you. Example: “I choose radiant vibrant health, a loving relationship with my life partner and a greater compassion in my heart.” No life stories nor explanations 🙂 DO NOT make a request involving another specific person! Then send $77 via PayPal from the Payment page. An email acknowledging receipt of your request and payment. 5-10 minutes prior to the event, you will receive an email from me inviting you to join a meeting via Zoom (an online video conferencing service that has much better quality than Skype). You will have to sign in with Zoom, but this does not cost you anything, nor do you receive anything further from Zoom. The Ceremony will be approximately one hour in duration. The Ceremony will be recorded, including your, and everyone else’s, interactions. Following the ceremony, you will receive a link that will enable you to download the video for your personal viewing at anytime. Permission is NOT given for you to share in any form this video on any platform, including but not limited to Facebook, You Tube, etc. You MAY share the viewing of this video with your immediate family members. You must have an internet connection and a video camera on your device in order to participate. Please adjust the settings on your device well prior to this event so all works smoothly for you. Smart phones, tablets and computers of all makes work just fine with Zoom.